Why would someone leave the academic science to create a startup? How companies are efficiently innovating in the field of EEG? Come discover the unique experience of our startupers and perhaps find a new career plan or new collaborations. A free event on July 4th at ICM! We are a French startup committed to providing scientifically validated technologies that support mental health, emotional wellbeing and human flourishing. Our multidisciplinary team of neuroscientists, psychologists, game developers and artists unites to bring unprecedented experiences to the general public in our first physical centers in Paris: personalized programs of self-exploration combining immersive virtual reality and real-time neurophysiology to offer access to never before seen paths that can help us transform the way we think, feel, and live. mBrainTrain started as a desire of three friends on their doctoral training on Biomedical signal processing. We wished to bring the concept of high-quality brainwave reading in a fully mobile environment to life. Starting from a duct-taped prototype that was able to measure quality brainwaves outside of the lab in 2012, we went to create a revolutionary device SMARTING, that is now one of the best high-end scientific mobile EEG devices. It is a fully mobile, wearable device for recording and analyzing electrical brain activity, in an unrestricted environment. It is now present in more than 30 top neuroscience labs across EU, US, and Canada, and has brought more than 500K euro worth of revenue. Physip is specialized in sleep and vigilance analysis using brain activity measured with EEG. Physip designs, develops and commercializes a range of innovative software solutions, all based on the same approach: a fully automated analysis, based on EEG only, and using 2 EEG sensors only: sleep analysis, sleep pressure measurement and risk of impaired performance. We develop innovative, powerful, flexible tools for precise, objective and reliable analyses. Physip provides researchers, clinicians and industrial R&D services with a data analysis service. We aim to make EEG accessible and help you work efficiently with EEG. The EEGsynth is an open-source Python codebase that provides a real-time interface between (open-hardware) devices for electrophysiological recordings (e.g. EEG, EMG and ECG) and analogue and digital devices (e.g. MIDI, games and analogue synthesizers). This allows one to use electrical brain/body activity to flexibly control devices in real-time. The EEGsynth does not allow diagnostics or provide a GUI for offline analysis. 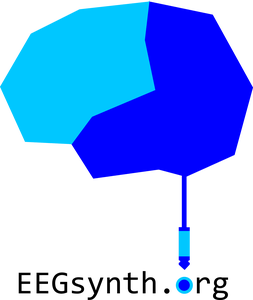 Rather, the EEGsynth is intended as a collaborative interdisciplinary open-source and open-hardware project that brings together programmers, musicians, artists, neuroscientists and developers.